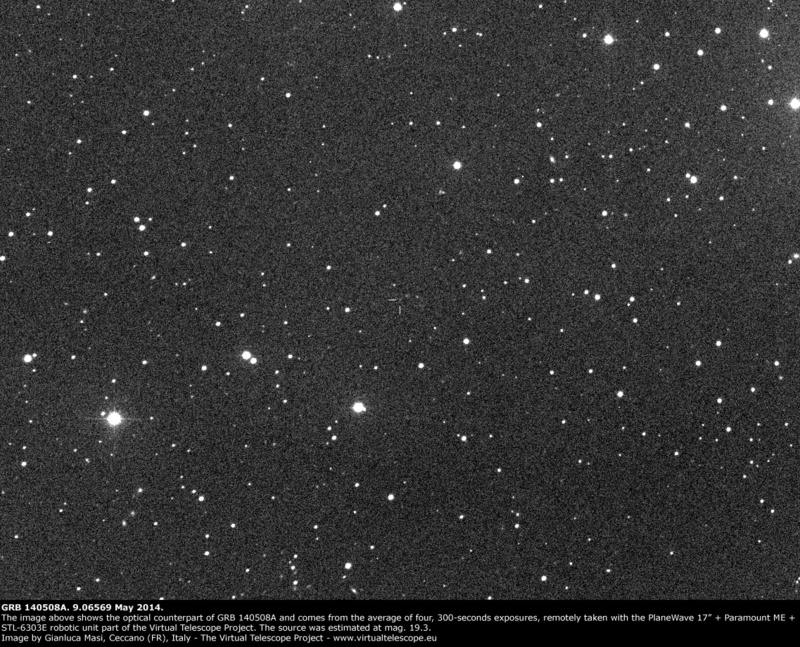 On the night of 9 May 2014, we tried to observe the optical counterpart of GRB 140508A, reported earlier the previous day. These afterglows fade quite quickly, but we tried anyway. Several 300 seconds unfiltered exposures were taken with he PlaneWave 17″ robotic unit, recording the afterglow at mag. 19.3. Photometry and astrometry were promptly performed and shared with the GRB community via the Nasa’s Gamma-ray Coordinates Network (GCN). Above is the average of 4 of those images and the preliminary analysis was published in the GCN 16235 circular. The redshift of the source was estimated to be z=1.03, corresponding to a huge distance of 7.8 billions of light years.